Adding round corners to your documents, covers, business cards or printed materials doesn't have to be difficult. All you need is a corner rounder or round corner cutter. Sometimes called cornerounders, or corner rounders, these machines help you to add a beautiful rounded radius to the edges of your documents. We carry a huge selection of this type of equipment from Akiles, Lassco Wizer, Tamerica and Challenge Machinery. Whether you need a small desktop unit or a larger electric machine, we have them all. We even carry a pneumatic model and the heavy duty electric Diamond 5, 6 and 7 machines that can round the corners of stacks up to almost 2" thick. Take a look at the different options and if you have any questions feel free to give us a call. Our customer service staff is here to help. Carefully crafted with only the highest quality components. Work with all standard materials, like: PVC, polyester, leather, paper, polypropylene, etc. Have high productivity: Specially designed to cut through multiple sheets at a time with the least effort and with minimum die depreciation. Are practical: With an interchangeable die system for your various jobs. The Model CR-20 desk top corner rounder handles up to 1/2" of stock per cut. It comes equipped with one standard cutting unit of your choice. (1/8", 1/4", 3/8", or 1/2"). For cutting paper and plastic products. The Model CR-50B heavy duty bench model corner rounder is designed with smooth rigid cutting action for hard-to-do jobs. It accepts a full range of interchangeable cutting units (1/16" to 1-1/2" radii) with a maximum cutting depth of 1/2". One standard cutting unit (1/8", 1/4", 3/8", or 1/2") is included. Cuts round corners with various radius with optional dies. Round corners help prevent "dog earing" and provide the extra enhancement step of professionals. The Model CR-50 Corner Rounder floor model is for large operations. Featuring hands-free operation and hold-down clamping that secures the stock with each stroke. Comes with choice of a standard cutting unit (1/8", 1/4", 3/8", or 1/2") and can easily be adaptable for using large radii up to 1-1/2". The Model CR-50P Corner Rounder floor model is for large operations. The Model CR-50XP Corner Rounder floor model is for large operations. The Model CR-55 Corner Rounder floor model is for large operations, with a 2" cutting capacity. Comes with 1 die and 1/4" and 3/8" blades. Comes with 1 die and 1/8" and 1/2" blades. Sheet Size: Up to 11" x 17"
Max. Punching Thickness: 1-1/2" - 1-3/4"
This is MyBinding video. If you need to round the corners of your documents, covers, business cards or printed materials, then you probably need a corner rounder or a round corner cutter. 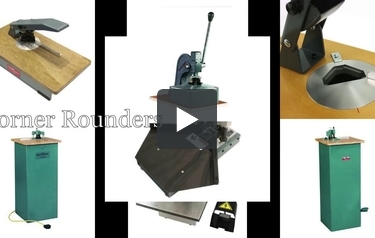 These corner rounding machines and tools help you to add a beautiful rounded radius to the edges of your document. We carry a huge selection of corner rounding equipment from both Akiles and LasscoWizer. Whether you need a small desktop corner rounder or a large electric rounding machine, we have you covered. We even carry a pneumatic model and a heavy duty electronic diamond five corner rounding machine which can round corners at stacks of up to almost 2” thick, and we have all the supplies that you’ll need to replace blades and have different sized blades. If you have any questions at all, just give us a call. Our customer service will help to find you exactly what you need. When image matters, MyBinding.